Our Elevated Outdoor Vegetable Planting BoxCan Bring A Rough-Sawn Look To Your Outdoor Decor. 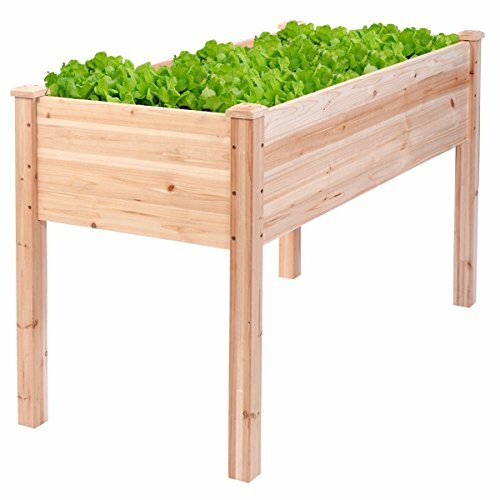 Ideal For Small Patios,Decks, Condos And Apartments, Or Anywhere You'd Like To Grow Vegetables, Herbs,Or Flowers. The Thick And Solid Wood Construction Make This Item Can Serve YourFor A Long Time. The Raised Planter Eliminates Bending Over While Gardening AndIs Perfect For Gardeners With Mobility And Back Strain Issues. It Will Be Worthy of Your Choice! Thickness Of Wood Board Reach 0.8"
Thickness Of Wood Board: 0.8"
Distance From Floor To Box Bottom:18.5"
【100% Natural Cedar Wood】Use completely natural Cedar to this garden bed, no chemical additives added, which is very environmentally friendly and harmless to human body. 【Stable and Durable Cedar Garden Bed】Amazing 0.8 inches thickness of this solid cedar wood ensures the durability and solidness, which is stable and durable enough to strongly support the weight from the garden bed itself and plant, ideal for all years' use. 【Outdoor and Indoor Usage】This plant bed can be placed not only at patios, porches, decks, balconies or garden. It features beautiful look and practical function. Not only can it serve as a decorative work but also fully plays its practical role. 【Spacious Deep Bed and Perfect Height】 The leg base height from floor to box bottom is about 18.5", suitable for gardening without bending over. The top bed with 47.2"X21.6"X10.8" (LxWxH) box dimension and 9.2" box depth, which is deep enough for you to put nutritious earth for plant healthy growth. 【Quick Assembly】Hardware and assembly manual are included. Specific assembly steps are clearly shown. All hardware are all listed and numbered for your reference.